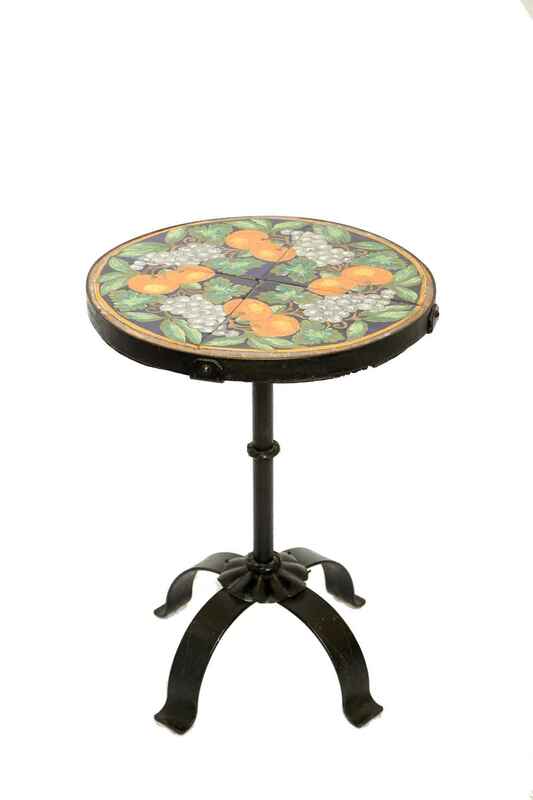 Accent table, attributed to Addison Mizner, having a round top of hand-painted tiles, on custom iron base, corner straps mount the top to its pedestal, ending in four, splayed legs, ending in scrolling feet. CONDITION: Good antique condition. Sturdy and functional table. Wear to tile edges demonstrated by photos. Accent table, attributed to Addison Mizner, having a round top of hand-painted tiles, on custom iron base, corner straps mount the top to its pedestal, ending in four, splayed legs, ending in scrolling feet. CONDITION: Good antique condition. Sturdy and functional table. Wear to tile edges demonstrated by photos.